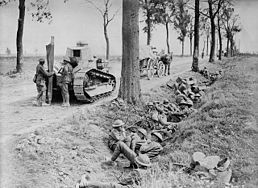 The Hundred Days Offensive was the final period of the First World War, during which the Allies launched a series of offensives against the Central Powers on the Western Front from 8 August-11 November 1918, beginning with the Battle of Amiens. The offensive forced the German armies to retreat beyond the Hindenburg Line and was followed by an armistice. The Hundred Days Offensive does not refer to a specific battle or unified strategy, but rather the rapid sequences of Allied victories starting with the Battle of Amiens. The great German Spring Offensives on the Western Front in 1918, beginning with Operation Michael had petered out by July. The Germans had advanced to the Marne River but failed to achieve a decisive breakthrough. When Operation Marne-Rheims ended in July, the Allied supreme commander, the French Ferdinand Foch, ordered a counter-offensive which became the Second Battle of the Marne. The Germans, recognising their untenable position, withdrew from the Marne towards the north, for which victory Foch was promoted Marshal of France. Foch considered the time had arrived for the Allies to return to the offensive. The Americans were now present in France in large numbers, and their presence invigorated the Allied armies. Their commander, General John J. Pershing, was keen to use his army in an independent role. The British Army had also been reinforced by large numbers of troops returned from campaigns in Palestine and Italy, and large numbers of replacements previously held back in Britain by Prime Minister David Lloyd George. A number of proposals were considered, and finally Foch agreed on a proposal by Field Marshal Douglas Haig, the commander of the British Expeditionary Force (BEF), to strike on the Somme, east of Amiens and southwest of the 1916 battlefield of the Battle of the Somme, with the intention of forcing the Germans away from the vital Amiens-Paris railway. The Somme was chosen as a suitable site for the offensive for several reasons. As in 1916, it marked the boundary between the BEF and the French armies, in this case defined by the Amiens-Roye road, allowing the two armies to cooperate. Also the Picardy countryside provided a good surface for tanks, which was not the case in Flanders. Finally, the German defences, manned by the German Second Army of General Georg von der Marwitz, were relatively weak, having been subjected to continual raiding by the Australians in a process termed Peaceful Penetration. The Battle of Amiens (with the French attack on the southern flank called the Battle of Montdidier (French: Bataille de Montdidier) opened on 8 August 1918, with an attack by more than 10 Allied divisions-Australian, Canadian, British and French forces-with more than 500 tanks. Through careful preparations, the Allies achieved complete surprise. The attack, spearheaded by Australian Corps and Canadian Corps of the British Fourth Army, broke through the German lines, and tanks attacked German rear positions, sowing panic and confusion. By the end of the day, a gap 15 mi (24 km) long had been created in the German line south of the Somme. The Allies had taken 17,000 prisoners and captured 330 guns. Total German losses were estimated to be 30,000 on 8 August, while the Allies had suffered about 6,500 killed, wounded and missing. The collapse in German morale led Erich Ludendorff to dub it "the Black Day of the German Army". The advance continued for three more days but without the spectacular results of 8 August, since the rapid advance outran the supporting artillery and ran short of supplies. During those three days, the Allies had managed to gain 12 mi (19 km), but most of that had occurred on the first day, as a result of the Germans adding reinforcements. On 10 August, the Germans began to pull out of the salient that they had managed to occupy during Operation Michael in March, back towards the Hindenburg Line. On 15 August 1918, Foch demanded that Haig continue the Amiens offensive, even though the attack was faltering as the troops outran their supplies and artillery, and German reserves were being moved to the sector. Haig refused, and instead he prepared to launch a fresh offensive by the British Third Army at Albert (the Battle of Albert), which opened on 21 August. Picture - 1 September 1918, P�ronne (Somme). A machine gun position established by the Australian 54th Battalion during its attack on German forces in the town. The offensive was a success, pushing the German Second Army back over a 34 mi (55 km) front. Albert was captured in 22 August. The attack was widened on the south, by the French 10th Army starting the 2nd Battle of Noyon (French: 2e Bataille de Noyon) on 17 August, capturing the town of Noyon on 29 August. On 26 August, to the north of the initial attack, the British First Army widened the attack by another 7 mi (11 km) with the Second Battle of Arras. Bapaume fell on 29 August (during the Second Battle of Bapaume). With the front line broken, a number of battles took place as the Allies forced the Germans back to the Hindenburg Line. East of Amiens (after the Battle of Amiens), with artillery brought forward and munitions replenished, the British Fourth Army also resumed its advance, with the Australian Corps crossed the Somme River on the night of 31 August, breaking the German lines during the Battle of Mont St. Quentin. On 26 August, to the north of the Somme, the British First Army widened the attack by another 7 mi (11 km) with the Second Battle of Arras, which includes the Battle of the Scarpe (1918) (26 August) and the Battle of Drocourt-Queant (2 September). South of the British Expeditionary Forces, the French First Army approached the Hindenburg Line on the outskirts of Saint Quentin during the Battle of Savy-Dallon (French: Bataille de Savy-Dallon) (10 September), and the French Tenth Army approached the Hindenburg Line near Laon during the Battle of Vauxaillon (French: Bataille de Vauxaillon) (14 September). The British 4th Army approached the Hindenburg Line along the St Quentin Canal during the Battle of x�pehy (18 September). By 2 September, the Germans had been forced back close to the Hindenburg Line, from which they had launched their offensive in the spring. Foch now planned a series of great concentric attacks on the German lines in France (sometimes referred to as the "Grand Offensive"), with the various axes of advance designed to cut the German’s lateral means of communications, intending that the success of a single attack would enable the entire Front Line to be advanced. The main German defences were anchored on the Hindenburg Line, a series of defensive fortifications stretching from Cerny on the Aisne River to Arras. Before Foch's main offensive was launched, the remaining German salients west and east of the line were crushed at Havrincourt and St Mihiel on 12 September; and at Epehy and Canal du Nord on 27 September. The first attack of Foch's "Grand Offensive" was launched on 26 September by French and American Expeditionary Forces in the Meuse-Argonne Offensive (this offensive also includes the Battle of Somme-Py (French: Bataille de Somme-Py) (26 September), the Battle of Saint-Thierry (French: Bataille de Saint-Thierry) (30 September), the Battle of Montfaucon (French: Bataille de Montfaucon) (6 October) and the Battle of Chesne (French: Bataille du Chesne) (1 November)). This offensive involved attacking over difficult terrain, resulting in the Hindenburg line not being broken until the 17 October. Two days later, the Army Group under Albert I of Belgium (the Belgian Army, the British Second Army under General Herbert Plumer and the French 6th Army under General Degoutte) launched an attack near Ypres in Flanders (the Fifth Battle of Ypres). Both attacks made good progress initially but were then slowed by logistic problems. On 29 September, the central attack on the Hindenburg Line commenced, with the British 4th Army led by the Australian Corps attacking the St. Quentin Canal (the Battle of St. Quentin Canal) and the French First Army attacking fortifications outside St Quentin (the Battle of St Quentin (French: Bataille de Saint-Quentin)). By 5 October, the Allies had broken through the entire depth of the Hindenburg defences over a 19 mi (31 km) front. Rawlinson wrote, "Had the Boche [Germans] not shown marked signs of deterioration during the past month, I should never have contemplated attacking the Hindenburg line. Had it been defended by the Germans of two years ago, it would certainly have been impregnable…"
Picture - Canadian troops shelter in a ditch along the Arras-Cambrai road. 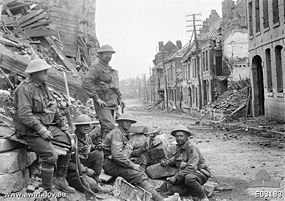 Subsequently (on October 8), led by the Canadian Corps, the 1st and 3rd British armies broke through the Hindenburg Line at the Battle of Cambrai. Through October, the German armies were forced back through the territory gained in 1914. The Allies were pressing the Germans back toward the lateral railway line from Metz to Bruges (shown in the map at the head of this article), which had supplied their entire front in Northern France and Belgium for much of the war. As the Allied armies reached this line, the Germans were forced to abandon increasingly large amounts of heavy equipment and supplies, further reducing their morale and capacity to resist. Casualties remained heavy in all of the Allied fighting forces, as well as in the retreating German Army. Rearguard actions were fought during the Pursuit to the Selle (9 October), Battle of Courtrai (14 October), Battle of Mont-D’Origny (French: Bataille de Mont-D'Origny) (15 October), Battle of the Selle (17 October), Battle of Lys and Escaut (French: Bataille de La Lys et De L'Escaut) (20 October) (including the subsidiary Battle of the Lys and Battle of the Escaut), Battle of the Serre (French: Bataille de la Serre) (20 October), Battle of Valenciennes (1 November) and the Battle of the Sambre (including the Second Battle of Guise (French: 2x�me Bataille de Guise) (4 November) and the Battle of Thi�rache (French: Bataille de Thi�rache) (4 November)), with fighting continuing until the last minutes before the Armistice took effect at 11:00 on 11 November 1918. One of the last soldiers to die was Canadian Private George Lawrence Price, two minutes before the armistice took effect. Christie, Norm M. (2005). The Canadians at Arras and the Drocourt-Queant Line, August-September, 1918. CEF Books. ISBN 1-896979-43-2. OCLC 60369666. Dancocks, Daniel George (1987). Spearhead to Victory-Canada and the Great War. Hurtig Publishers. p. 294. ISBN 0-88830-310-6. OCLC 16354705.